Quarters have been minted in the United States since 1796. There are eight different design types but only three are usually encountered by the Public: “Barber” quarters, Standing Liberty quarters and Washington quarters. The Barber quarter, named after its designer, Charles Barber, has a male representation of Liberty facing to the right. It was first minted in 1892, and continued to be made until 1916. It was followed by the Standing Liberty design made from 1916 until 1930. This beautiful coin features a full-length figure of Liberty. 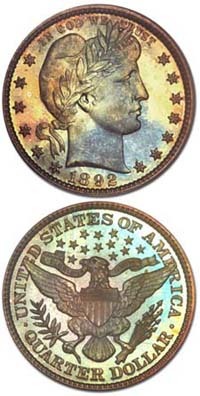 The Barber design has its mint mark on the reverse below the eagle. The Standing Liberty design has its mintmark on the front of the coin. It is just above and to the left of the date, directly to the right of the bottom star. The current design is the Washington quarter, made since 1932. Until 1964, the mintmark on a Washington quarter was on the reverse below the wreath. Since 1968, the mintmark can be found to the right of the ribbon on Washington’s hair. Standing Liberty Quarters are usually found very worn, and are worth a small premium over common bullion related quarters. (remember these are for worn pieces AG-good grade). There are two very rare dates in the series and several lesser ones. The 1916 is worth about $2000 and the 1918 over 17-S is worth about $1100 in average circulated grades. Several others such as the the 1921 and 1923-S are scarce and can bring well over $100. Any quarter dated 1964 or earlier will be worth at least its silver value, .18084 troy oz pure silver (gross weight is 6.25 grams). Rare dates in the series include the 1932-D and S and these are worth, in the lowest grades, about $125 each but considerably more in higher grades. Quarters minted form 1965 to the present are a copper-nickel alloy (gross weight 5.67 grams) and currently have no numismatic premium. In 1975 and 1976, the Bicentennial Washington quarter was made which features the dual date 1776-1976. Millions of these coins were made for general circulation. They are currently only worth face value. In 1999, the United States Mint began the 50 State Quarters program, a circulating commemorative coin series featuring a reworked Washington portrait obverse and a different, unique reverse for each of the 50 States. The coins are issued in the same order that the states joined the Union. The State Quarter series has become the most popular commemorative coin program in U.S. history, with the U.S. Mint estimating that over 100 million people now actively or casually collect the series. Originally scheduled to last through 2008, the program was extended by legislation to include the District of Columbia, the Commonwealths of Puerto Rico and the Northern Mariana Islands, and the U.S. territories of Guam, the U.S. Virgin Islands and American Samoa.